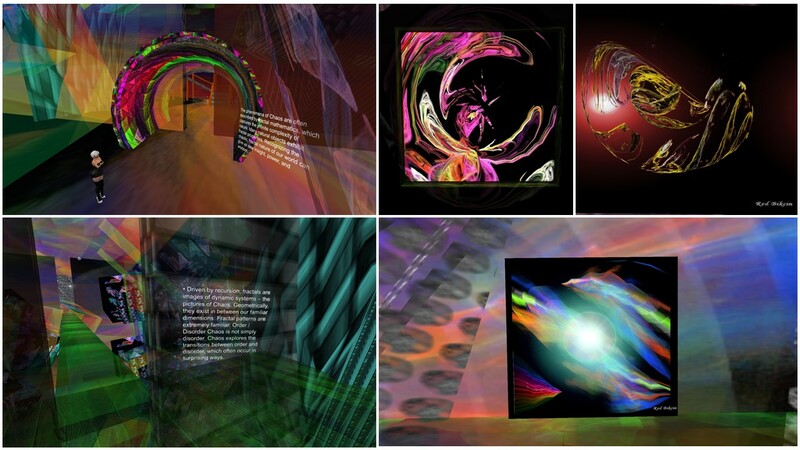 Saturday, June 23rd, when I scrolled over the new entries at scoop.it SL Destinations my attention was caught by a title and a picture “Fractal Chaos Theory – Redi (red.bikcin) – Diotima, Gigli Waves, Second life“. I like fractals and they always attracted me in their simplicity and simlutaneously in their complexity. 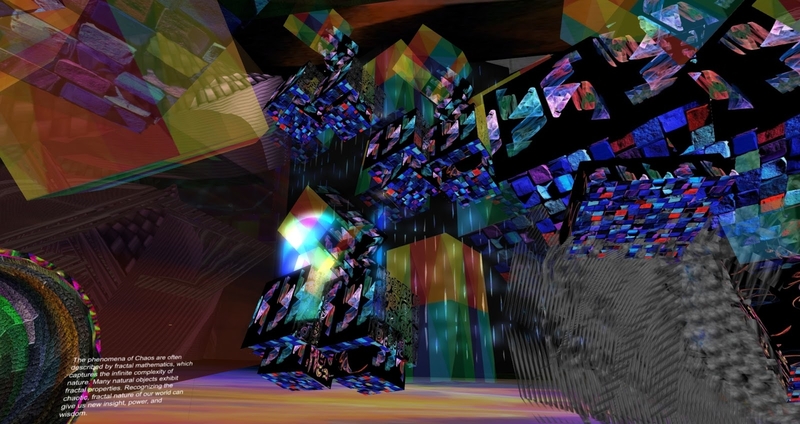 I have seen quite some great exhibtions of fractal art in Second Life already. The title caught my attention because of Diotima, which is a greek name and up to today a quite rare female fist name. When I joined Second Life more than 10 years ago, I selected this name as my first name – and made a typo. That’s how Diomita was created. This said, I had to visit this place. It is an art gallery. I couldn’t find out really much about it as there’s no notecard and no landmark description. The plot is owned by a group named Red&Danni, which was founded by Jos Kass. The group picture contains a text “R&D art gallery” – Red&Danni art gallery? The plot is named “Diotima, Ocio y Cultura”. Ocio y Cultura is Spanish and means leisure and culture. I assume that Redi (Red Bikcin) is involved or co-owning the R&D gallery. Currently there’s an exhibition of Red Bikcin’s fractal art. The exhibition is quite large and extends over 2 floors. Where you enter the gallery there’re innumerable live sized holograms of one and the same person in black and white, obviously it is a neko. 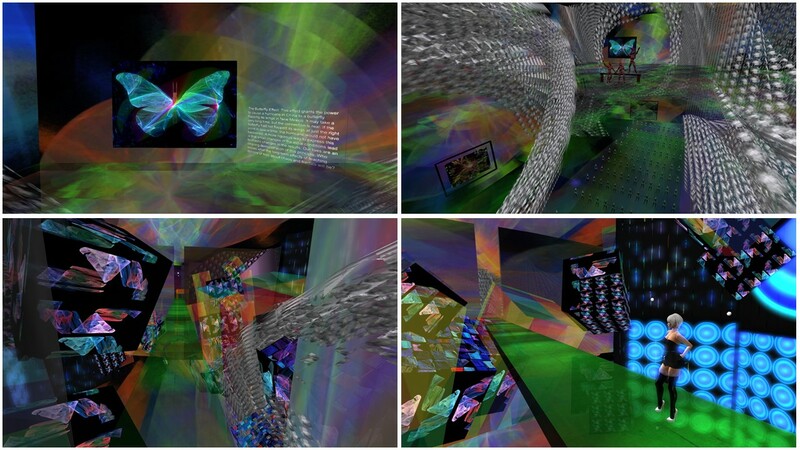 The room is surrounded by big fractal objects and at it’s end you walk through a colourful archway into another room. Every once in a while you find educational texts about fractals and I will quote them later on. 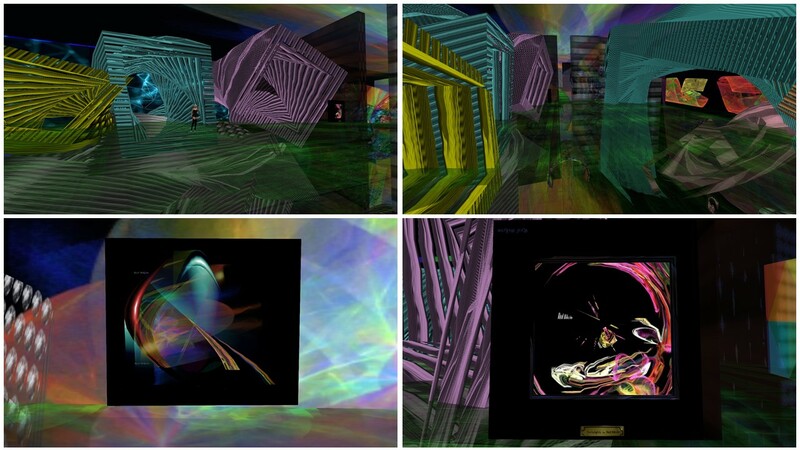 The second room and the whole second floor, that you reach walking upstairs at the end of the second room, has large fractal objects and most of them are steadily moving. They are transparent and often you literally walk through them. Every piece is very colourful, the whole exhibtion is very colourful. Embedded are some single pieces of Red Bikcin, and some of them are even for sale for reasonable prices. Red Bikcin’s exhibition about fractals at R&D gallery is not only educational, it lets you experience the fractals as you’re surrounded by them in all dimensions. And as many of the fractals and objects are steadily changing and moving, you get different imrepssions every second. The concept with transparent walls and floors give the impression of endlessness. I had a closer look at the single objects of Red Bikcin as well and I really liked them, smaller pieces of art that do unfold their effect even as a stand-alone piece of art. At the end of my visit I bought one of Red Bikcin’s stand-alone objects and placed it at home near to our dancefloor. Slowly I begin to get a collection of art presented in Second Life. June 23rd at home: Diomita placing Red Bikcin’s fractal art piece near to the dance floor. It’s a shame that there’s no more information about the artist Red Bikcin and her profile doesn’t give away much of her as well (as I don’t speak Spanish). I enjoyed my visit very much! Thank you Redi for your art, the educational texts about fractals and the wonderful and colourful experience that you provide with this exhibition. Thank you Jos Kass and whoever else is involved in the R&D gallery.